Leah Hogsten | The Salt Lake Tribune Salt Lake City International Airport's first phase construction of the $3.6 billion project is hitting the halfway mark — and large new buildings and elevated roadways are more easily seen. Nearing completion is the new concourse for aircraft gates, an enclosed new terminal, the steel skeleton of a new “gateway” building, a new five-story parking garage and elevated roadways. Leah Hogsten | The Salt Lake Tribune Salt Lake City International Airport's first phase construction of the $3.6 billion project is hitting the halfway mark Ñ and large new buildings and elevated roadways are more easily seen. Nearing completion is the new concourse for aircraft gates, an enclosed new terminal, the steel skeleton of a new ÒgatewayÓ building, a new five-story parking garage and elevated roadways. Leah Hogsten | The Salt Lake Tribune Salt Lake City International Airport's first phase construction of the $3.6 billion project is hitting the halfway mark — and large new buildings and elevated roadways are more easily seen. Nearing completion is the new concourse for aircraft gates, an enclosed new terminal, the steel skeleton of a new “gateway” building, a new five-story parking garage and elevated roadways. Leah Hogsten | The Salt Lake Tribune Salt Lake City International Airport's first phase construction of the $3.6 billion project is hitting the halfway mark Ñ and large new buildings and elevated roadways are more easily seen. Nearing completion is the new concourse for aircraft gates, an enclosed new terminal, the steel skeleton of a new ÒgatewayÓ building, a new five-story parking garage and elevated roadways. Leah Hogsten | The Salt Lake Tribune Salt Lake City International Airport's first phase construction of the $3.6 billion project is hitting the halfway mark Ñ and large new buildings and elevated roadways are more easily seen. Nearing completion is the new concourse for aircraft gates, an enclosed new terminal, the steel skeleton of a new ÒgatewayÓ building, a new five-story parking garage and elevated roadways. Leah Hogsten | The Salt Lake Tribune Salt Lake City International Airport's first phase construction of the $3.6 billion project is hitting the halfway mark Ñ and large new buildings and elevated roadways are more easily seen. Nearing completion is the new concourse for aircraft gates, an enclosed new terminal, the steel skeleton of a new ÒgatewayÓ building, a new five-story parking garage and elevated roadways. 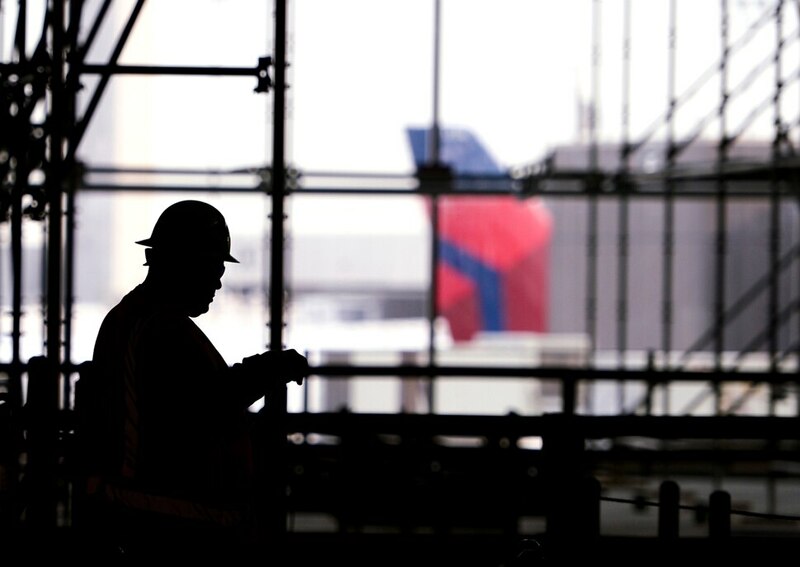 Leah Hogsten | The Salt Lake Tribune Salt Lake City International Airport's first phase construction of the $3.6 billion project is hitting the halfway mark — and large new buildings and elevated roadways are more easily seen. Nearing completion is the new concourse for aircraft gates, an enclosed new terminal, the steel skeleton of a new “gateway” building, a new five-story parking garage and elevated roadways. Leah Hogsten | The Salt Lake Tribune Henry Flores, Salt Lake City International Airport worker on Wednesday, August 1, 2018. The first phase construction of the $3.6 billion project is hitting the halfway mark Ñ and large new buildings and elevated roadways are more easily seen. Nearing completion is the new concourse for aircraft gates, an enclosed new terminal, the steel skeleton of a new ÒgatewayÓ building, a new five-story parking garage and elevated roadways. 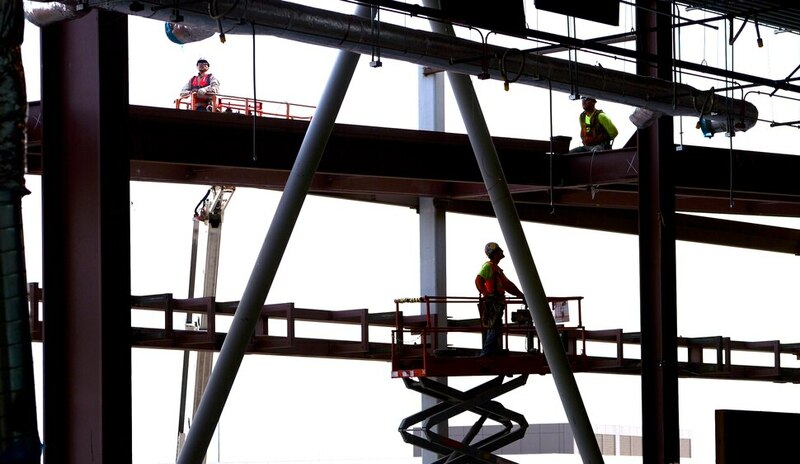 Leah Hogsten | The Salt Lake Tribune Salt Lake City International Airport's first phase construction of the $3.6 billion project is hitting the halfway mark Ñ and large new buildings and elevated roadways are more easily seen. Nearing completion is the new concourse for aircraft gates, an enclosed new terminal, the steel skeleton of a new ÒgatewayÓ building, a new five-story parking garage and elevated roadways. Leah Hogsten | The Salt Lake Tribune Salt Lake City International Airport's first phase construction of the $3.6 billion project is hitting the halfway mark Ñ and large new buildings and elevated roadways are more easily seen. Nearing completion is the new concourse for aircraft gates, an enclosed new terminal, the steel skeleton of a new ÒgatewayÓ building, a new five-story parking garage and elevated roadways. Leah Hogsten | The Salt Lake Tribune Salt Lake City International Airport's first phase construction of the $3.6 billion project is hitting the halfway mark Ñ and large new buildings and elevated roadways are more easily seen. Nearing completion is the new concourse for aircraft gates, an enclosed new terminal, the steel skeleton of a new ÒgatewayÓ building, a new five-story parking garage and elevated roadways. Leah Hogsten | The Salt Lake Tribune Salt Lake City International Airport's first phase construction of the $3.6 billion project is hitting the halfway mark Ñ and large new buildings and elevated roadways are more easily seen. Nearing completion is the new concourse for aircraft gates, an enclosed new terminal, the steel skeleton of a new ÒgatewayÓ building, a new five-story parking garage and elevated roadways. Leah Hogsten | The Salt Lake Tribune Cameron Balfour walks amid Salt Lake City International Airport's first phase construction. The $3.6 billion project is hitting the halfway mark Ñ and large new buildings and elevated roadways are more easily seen. Nearing completion is the new concourse for aircraft gates, an enclosed new terminal, the steel skeleton of a new ÒgatewayÓ building, a new five-story parking garage and elevated roadways. Leah Hogsten | The Salt Lake Tribune l-r Salt Lake City International Airport construction manager Leon Nelson and project manager Mike Williams give details about the airport's first phase construction of the $3.6 billion project to members of the Airport Advisory Board during a tour Wednesday, August 1, 2018. Leah Hogsten | The Salt Lake Tribune Salt Lake City International Airport's first phase construction of the $3.6 billion project is hitting the halfway mark Ñ and large new buildings and elevated roadways are more easily seen. Nearing completion is the new concourse for aircraft gates, an enclosed new terminal, the steel skeleton of a new ÒgatewayÓ building, a new five-story parking garage and elevated roadways. Leah Hogsten | The Salt Lake Tribune Salt Lake City International Airport's first phase construction of the $3.6 billion project is hitting the halfway mark — and large new buildings and elevated roadways are more easily seen. Nearing completion is the new concourse for aircraft gates, an enclosed new terminal, the steel skeleton of a new “gateway” building, a new five-story parking garage and elevated roadways. Leah Hogsten | The Salt Lake Tribune Salt Lake City International Airport's first phase construction of the $3.6 billion project is hitting the halfway mark Ñ and large new buildings and elevated roadways are more easily seen. Nearing completion is the new concourse for aircraft gates, an enclosed new terminal, the steel skeleton of a new ÒgatewayÓ building, a new five-story parking garage and elevated roadways. Salt Lake City International Airport Director Bill Wyatt says most Utahns don’t seem to realize that an entirely new airport is rising next door to the existing one — which will be torn down in a few years. “It’s sort of a well-kept secret,” he says. “People know something’s going on because when you drive out here, you see the cranes and the weird roadways” around construction, but many think it is just remodeling or renovation. “This is the largest construction project in the history of the state,” he says, something becoming more visible now that construction on the first phase of the $3.6 billion project is hitting the halfway mark — and large new buildings and elevated roadways are going up. 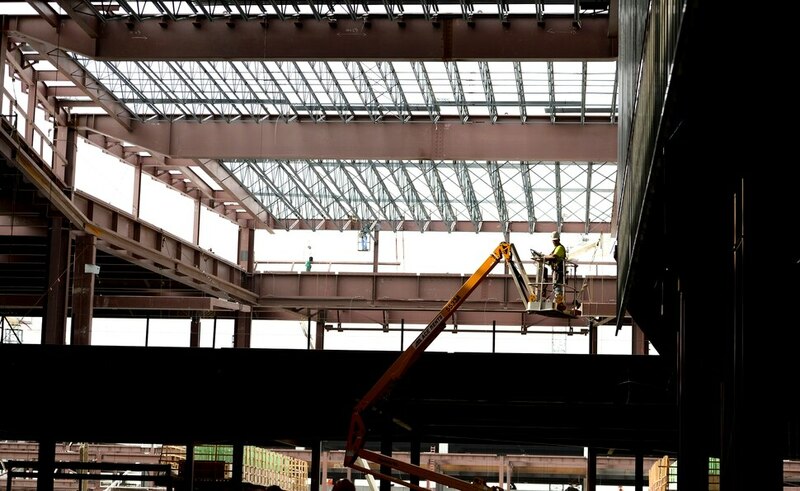 The city’s Airport Advisory Board toured the complex Wednesday, and saw the mostly completed exterior of a new concourse for aircraft gates, the enclosed new terminal, the steel skeleton of a new “gateway” building, a new five-story parking garage and under-construction elevated roadways. A second concourse is also starting to rise. Some motorized walkways are in (but covered to protect them from other construction), and much of the six miles of baggage-moving systems are installed. Construction “is in the 50 percent range overall” of completion, said project manager Mike Williams. The first phase is scheduled to open in about two years in late 2020. At that time, a second phase will begin to tear down the existing airport to extend the new concourses, although some existing gates will continue in use initially. Williams said many people do not realize how vast the project is because, so far, most of the construction has been out of public view. “One of the primary goals is not to impact the operation of the existing airport. We try not to interfere with the traveling public,” he said. That meant locating away from and largely out of sight of where passengers are now. “I don’t think local people have a sense about the scale of what’s happening here. It’s absolutely extraordinary,” Wyatt said, adding it will be much more spacious and have far more concessions than existing facilities. When completed, the new south concourse will be 12 football fields long. At the end of the first phase, it will be seven football fields long. A similar second, parallel concourse is being built to the north and initially will be half as long — but may expand in the future. About 1,750 construction workers are on the project now, and the airport is spending between $50 million and $70 million a month, Williams said. It will even have an extra large space to accommodate the crowds that often welcome returning Mormon missionaries. That lounge area now has a big cozy fireplace roughed in.